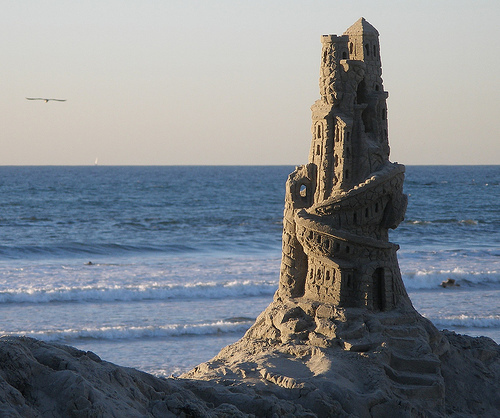 Off the Beaten Path: Are You Building Sandcastles? So how are you with change? I like to think I'm all for it, but the truth is I usually wrestle against it. Oh sure, after God has finally unclenched the fists I have so tightly wrapped around the here and now, I usually find the change He brought into my life was for the good. I look back and think, "That was the best thing that could happen. I'm so glad things changed." But I'm the kind of person who likes to have a plan, stick to the plan and follow the plan all the way through. I like to know what I'm getting into and once I'm into it I want to stay there. And change is fine with me as long as I get the memo far enough in advance too. But, as I'm sure you've found in your life, God is not in the habit of notifying me of changes so that I can cancel my previous plans in a timely manner. The truth is, I get into my dilemmas with change because I formulate plans that were never on God's itinerary. I like to assume God has shown me the discourtesy of suddenly switching to Plan B, but actually He never gave me the details of Plan A. I had just presumed I knew what I was doing, where I was going. He had other plans from the get-go. but the ark of God dwells inside tent curtains. The prophet Nathan was every bit as hasty as David and told the king to "Go, do all that is in your heart, for the Lord is with you." It turned out Nathan had misspoken. Sure, God was with David, but He had other plans for him. That very night God spoke to Nathan and straightened him out. God didn't need David to build Him a house. He hadn't complained about living in a tent. Besides, He had other plans for David. David was a warrior king. He was brave, smart in battle, capable with a sword, quick on his feet, cunning and strong. Yes, he was a man with a tender heart, a poet's heart. But God wanted to use that heart to create a passionate battle king, one who would defeat the enemies of Israel, conquer the land, and set up a strong and secure nation. David wanted to build a house, God wanted to use him to build a kingdom. I think there have been times when I have gotten busy trying to build God a house, too. I've picked a project based on my desires, my talents, my interests. They've been noble projects; others have done the same sorts of thing to honorable ends. But they were just pie in the sky ideas. They were my ideas, not God's. But God told David through His prophet Nathan that he had bigger plans for him. In fact, if David got on board and did things God's way instead of his own, God was going to bless David far beyond his imagination. That humbled David. It humbles me too. 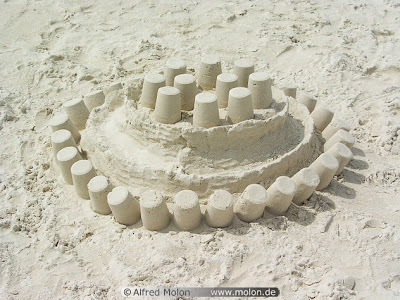 It occurs to me that my ideas for serving God often amount to nothing more than building castles in the sand while God would have me building an eternal kingdom. And if I dust the sand from my hands and join God in His plans for me with passion and enthusiasm, I too will be blessed beyond my wildest dreams. I've watched it happen. 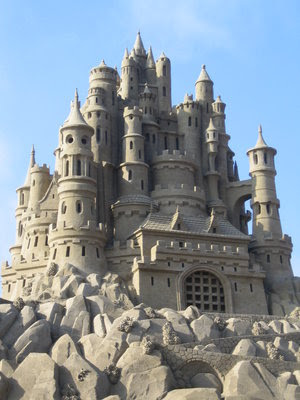 There have truly been times when I have left my castle in the sand, as elaborate and well-thought-out as it may have been, and followed God in a different direction only to look back and see my little castle swallowed up by the waves. And while you would think it would have broken my heart to look back and see my "project" disappear in the water, it was actually no great loss because I was on to bigger and better things...God's things. Let me ask you a question. Do you have sand on your hands? Or have you yielded your life -- plans and all -- to the One who is busy building an eternal kingdom? He has a job for you, dear friend, and He's ready to bless your socks off if you'll say yes to Him. His plans may not be your plans. But they are undoubtedly better, higher, for your good (Jeremiah 29:11). Today's thoughts come from 2 Samuel 7.